Working through Honeybee energy modeling and I realized I have many many things to learn about OpenStudio. Wanting to learn more I found this book at the weekend and downloaded on my Kindle. Personally I’m finding this a useful step by step guide. Sharing details about the book below for any interested souls. Great resource @seanmoo , thanks for sharing. FYI, regarding OpenStudio workflows, unfortunately for all of us the DOE has decided to discontinue the GUI of the OpenStudio (the OpenStudio Application), and transfer responsibility to third parties (who are yet unknown) by 2020. 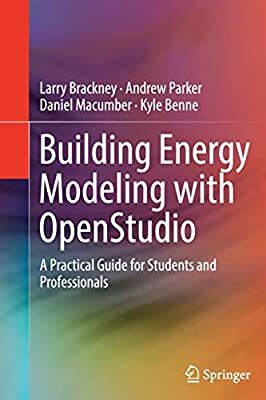 The good news is, that the DOE is continuing to develop the software development kit (SDK) for OpenStudio, so this doesn’t effect Honeybee energy modeling… it just means we can’t depend on having the OpenStudio GUI as a way to perform more nuanced energy modeling workflows.